Celestial Origins of the Weeping Eye Motif? The Ocmulgee Earth Lodge bird effigy featured the earliest instance of a symbol that would become increasingly prevalent in Mississippian culture: the weeping eye motif. This motif is likely to have been inspired by the appearance in the night sky of a spectacular comet sometime around 1000 A.D. Bright comets reveal their two tails, possibly the inspiration for the weeping eye motif. 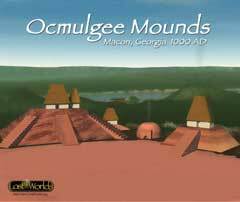 Weeping eye motif surrounds the eye of the bird platform in the Ocmulgee Earth Lodge. This famous rock art from Chaco Canyon is thought to show the Crab Nebula supernova of 1064 AD. Rarely is it mentioned that the same rock art also shows an extremely bright comet. [Photo (c)Peter Faris, RockArtBlog] This sketch gives better detail of the comet design below the crescent moon and star designs thought to represent the explosion of a super nova in the constellation Taurus. 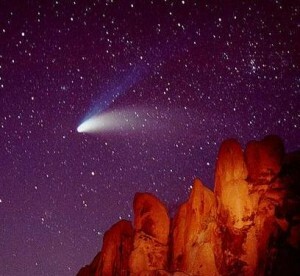 The Chinese have records of such a comet appearing on August 4, 1018 AD. 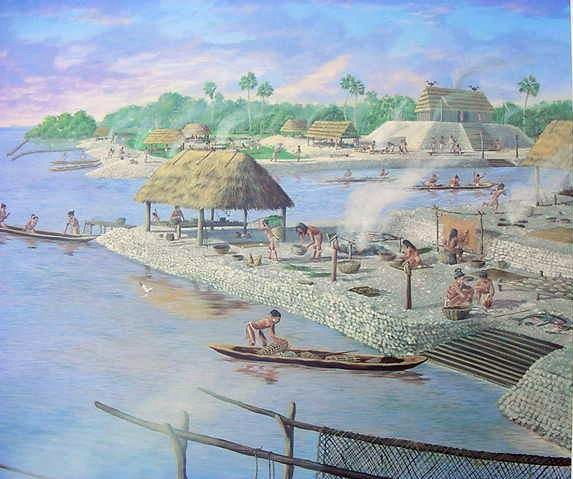 Archaeologists were able to radio carbon date the Earth Lodge to 1019 AD from charcoal found in its remains. 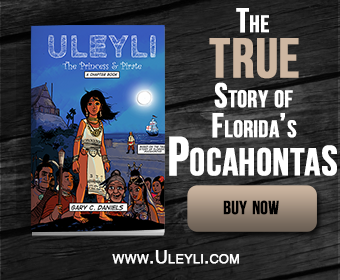 (It appears the Earth Lodge was burned deliberately likely as part of a ceremony.) The Chinese records indicated that the comet’s tail stretched nearly 44 feet across the sky making it one of the largest and brightest comets of all time. 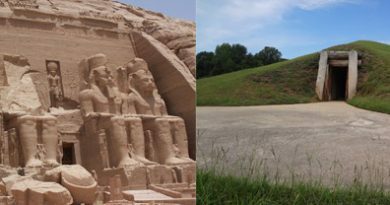 Perhaps the appearance of this comet inspired the construction of this Earth Lodge and the bird effigy was meant to represent this other being in the sky just as the eagle was often used to represent the sun. The Chaco Canyon comet uses a Puebloan sun symbol as its head suggesting this comet was especially bright! 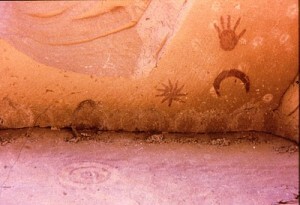 According to the Hopi who are descended from the people who built Chaco Canyon, we are still living in the Fourth Sun. They believed the Fifth Sun would begin when the Blue Star Kachina appeared. 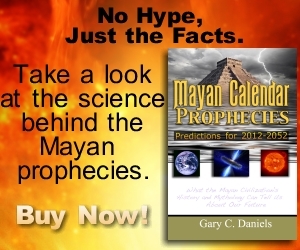 So what happened in 1011 AD that convinced the Aztecs that the Fourth Sun had ended and the Fifth Sun had begun? Gamma ray burst emitted from the center of a galaxy. In that very year the Chinese recorded a “guest star,” their name for supernovas, that appeared near their constellation known as the Rice Ladle. In western astronomy this is known as the Milk Ladle asterism and is located in the constellation Sagittarius. The center of our Milky Way galaxy appears right next to the constellation Sagittarius in the night sky. 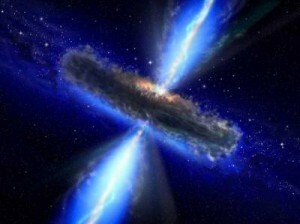 The center of many galaxies experience massive energy bursts from time to time called gamma ray bursts. It has been theorized that if our galaxy ever experienced one of these bursts it would appear on Earth as the appearance of a bright blue star appearing in the galactic center. Was this what the Chinese astronomers observed in 1011 AD? 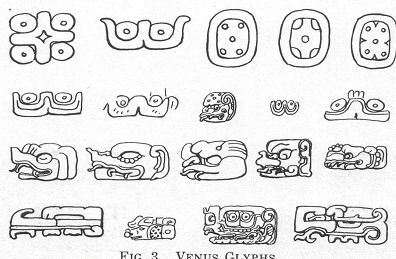 The Milk Ladle asterism is thought to be represented on the lower left flange of the Aztec Calendar Stone. Does the Chaco Canyon rock art depict this event and not the assumed Crab Nebula supernova of 1064 AD? The most famous Aztec artifact is their Sun Stone or Stone of the Fifth Sun. It commemorates the birth of the Fifth Sun. Interestingly, on the outer rock flange of the sculpture is a pattern of circles which has been interpreted as representing a star group. 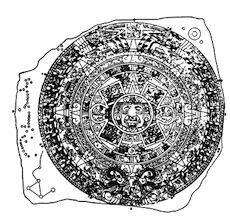 In fact, astronomer Robert S. McIvor argued in his paper “Star Patterns on the Aztec Calendar Stone” which appeared in the Journal of the Royal Astronomical Society of Canada that the circles appear to represent the Milk Ladle asterism. Why would the Aztecs choose to represent this star group on their most important sculpture commemorating the birth of the Fifth Sun in 1011 AD if it wasn’t somehow related? and an innumerable multitude of people. 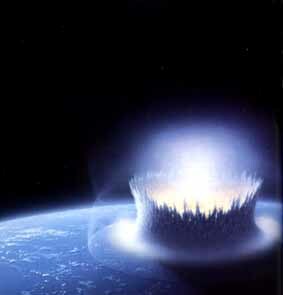 A comet impacts the ocean in this artist’s depiction. Researcher Dallas Abbott of the Lamont Observatory at Columbia University has theorized that a comet or fragments of a comet impacted the middle of the Atlantic Ocean in 1014 AD. The impact sent tsunami waves in all directions with one causing the massive flooding in England recorded in the Anglo-Saxon Chronicles. 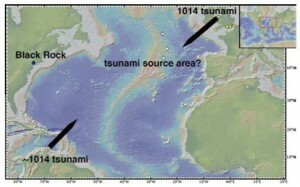 Abbott has also discovered tsunami deposits as far south as the Caribbean and South America that dated to this same time period. In addition to tsunami deposits, Abbott also found sediments and impact debris in a bog in Black Rock, New York. The only way for this debris to be found at this location is if it were ejected from the bottom of the ocean by a massive impact and hurled the thousand plus miles to this location. Map of the possible location of the comet impact based on tsunami deposits. The description of a comet impacting the ocean fits all the details of the Aztec legends about how the Fourth Sun came to an end in 1011 AD. 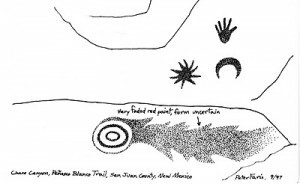 As the comet approached the Earth and entered the atmosphere it would have appeared as bright as the sun thus the Aztec legends of the sun crashing and the Chaco Canyon rock art depiction of a comet with a solar symbol are fitting. Interestingly, two Aztec xiuhcoatls or “fire serpents” are carved around the outer edges of the Aztec Calendar Stone, a very appropriate description of a comet as it entered the atmosphere fully ablaze with a long fiery serpentine tail, perhaps breaking into two major fragments or “fiery serpents.” The tail of the Chaco Canyon comet also appears fiery, more suggestive of a comet entering the atmosphere than one in the distant night sky. The impact would have ejected large amounts of water that would have fallen from the sky followed by a tsunami that would have flooded coastal areas. With this event following only three years after the appearance of a blue “guest star” in the night sky, it is easy to understand why the Aztecs believed they had experienced the end of another era. The Chaco Canyon rock art featuring both a supernova and a bright fiery comet in close proximity likely commemorates these cosmic events. The date of this event occurring on the eve of St. Michael’s day which corresponds with September 28, 1014 is very telling. Taking precession into account, this date corresponds with the beginning of Taurid meteor shower activity. This meteor shower is produced by remnants of the Comet Encke which is theorized to have produced impact events in the past. This is the same comet and meteor shower thought to have been involved in the 536 AD impact event that brought about global cooling and the end of many ancient civilizations in the Old World such as the Romans and in the New World such as Teotihuacan. 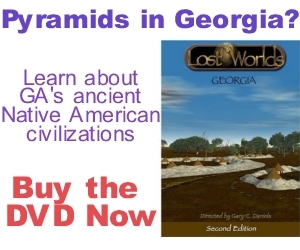 It was also around this time that the previous site in our discussion on Ancient Civilizations of Georgia, the Kolomoki Mounds complex, also went into decline. Continues….